LOCATION.--Lat 39`42'24", long 76`06'56", Cecil County, MD, Hydrologic Unit 02050306, at single-span steel-truss bridge on New Bridge Road, 1.0 mi south of PA-MD state line, 1.3 mi northeast of Richardsmere, and 2.5 mi east of Rock Springs, MD. PERIOD OF RECORD.--December 19, 2005 to current year. GAGE.--Water-stage recorder and crest-stage gage. 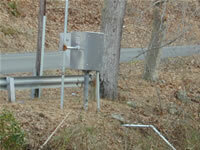 Datum of gage is 120 ft above National Geodetic Vertical Datum of 1929, from topographic map. COOPERATION.--Station established and maintained by the U.S. Geological Survey in cooperation with the Pennsylvania Department of Environmental Protection and the Susquehanna River Basin Commission.